REUTERSFireEye Inc. Chairman of the Board, David DeWalt (R) and Founder Ashar Aziz (L) pose with Nasdaq CEO Robert Greifeld outside the Nasdaq Market site in Times Square following the company’s debut on the Nasdaq exchange in New York, September 20, 2013. 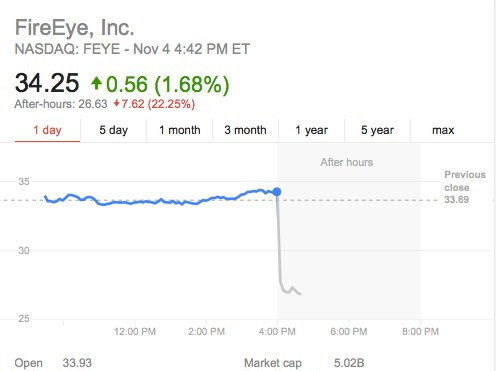 FireEye disappointed investors when it announced earnings and guidance that fell short of expectations. The shares are down a whopping 23% in after-hour trading. FireEye was one of the most beloved stocks at the start of the year. In the months that followed the company’s spectacular IPO last September, urged on by gung-ho Wall Street analysts, the stock soared to a high of over $US97, compared to the $US20 open price of its IPO. At that high point, the company sold another 5.6 million shares and raised another $US300 million, the same amount as its IPO. Then the company started warning investors that it wouldn’t pull in as much revenue this year as it previously forecast, sending it into a downward spiral. 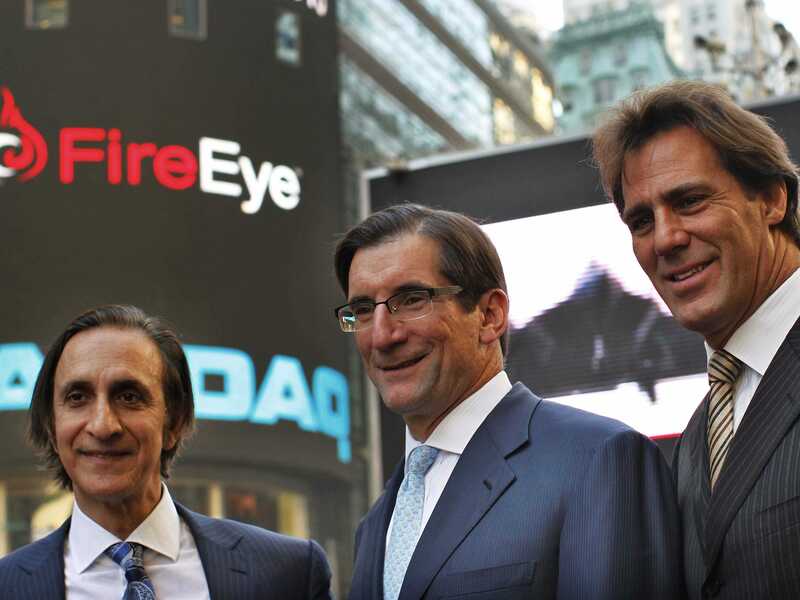 On Tuesday, FireEye revealed its third quarter results. Sales grew to $US114.2 million, up 168% over the year-ago quarter as it more than doubled its customer base to 2,761 customers. But that was on the low end of the guidance it gave of $US114 to $US117 million. Analysts were looking for $US116.2 million. The company reported a net loss of 51 cents of share excluding special items (non-GAAP net loss was $US73.9 million), which beat analysts expectations of 55 cents per share. But the bigger problem is the company downgraded its full-year outlook. It says it expects to finish the year at $US418-430 million, compared with the prior guidance range of $US423-430 million. Analysts were expecting $US428.5 million. So that means, if it FireEye comes in on the low end, it would be another miss. FireEye expects loss per share of $US2.05 to $US2.15. Analysts are expecting $US2.13. The reason it flew so high to begin with is that the company makes a computer security product that’s able to stop targeted hack attacks that were previously almost impossible to stop. It’s also been using the money it raised on acquisitions to branch out to other hot areas of computer security. A few weeks later, after FireEye’s stock had fallen 50% off its high, Barclays lowered its target to $US40 but still called it “one of the most disruptive” technologies. Lately, analysts on average have been saying the stock was worth $US40. It’s trading below $US27 after-hours, down from about $US34 earlier today.